This book is on a kindle countdown deal on Amazon 8/11/2018 - 8/18/2018 (price drop from $2.99 to 99 cents)! This is a historical tale about a burned-out private investigator cracking the case of multiple murders of Alaskan Native women in Anchorage, Alaska in the late 1990's. While fiction, it borrows from the truth of the times and the true wonders of the people who overcome an evil man and the underlying forces of racism. 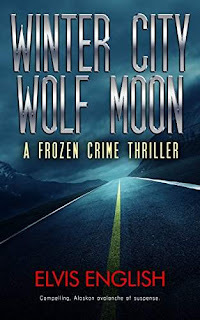 Winter City Wolf Moon comes from an insiders view of life in Alaska, fictionalizing the roller coaster ride with crackling dialogue and descriptions born in the streets and lives of the inhabitants of downtown Anchorage. The villain is frighteningly vicious and proves it with each passing chapter of the book. If you like engaging, fast-paced, and remarkably well-written thrillers, catch this taut, tense, Alaskan avalanche of suspense.